Musical theater is my favorite art form, and new original musicals are my favorite things in the world. I love seeing how music and theater can combine to tell a story in interesting forward-thinking ways. After re-imagining a couple of classic musicals (and one play), newish theater company 7th House Theater has turned to producing new original musicals. The Passage, Or What Comes of Searching in the Dark, is the third such creation to be presented in the Guthrie Theater Studio (now for just $9 per ticket). It's the first one for which company member David Darrow has written music, lyrics, and book (he's previously worked with a co-composer and/or book writer). I've loved all of their work, but this one feels more personal and more modern and forward-thinking than what they've done before. Jonah and the Whale is a folk musical that harkens back to the early 20th Century, The Great Work is almost operatic and classical in feel, but The Passage feels like it's continuing along the trajectory of modern musicals like Next to Normal and Fun Home - an intimate family story told with a small cast and modern inventive staging. And the result is truly something special. I can't help feeling that we're going to lose the incredibly talented artists of 7th House to New York someday (to Broadway's benefit), so we need to relish their work while we still can, and then someday we can proudly say "we knew them when." The Passage tells the story of an 11-year-old boy named Albert, a normal kid with a normal life, except that something about it is not quite right. 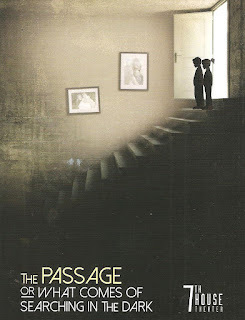 There's a monster in his basement, keeping his dad captive, and his mother is the only one who's allowed to visit him. But of course the monster isn't really a monster, and what this monster is that is devouring his dad is soon made clear. Albert is determined to save his dad from the monster, and enlists his new neighbor and friend Cassie to help him, as they brave the scary basement where they encounter a closet creature made of coats and a couple of not very brave knights. Turning the Rubik's cube and getting closer to the solution gets Albert closer and closer to his dad, and when he finally finds him, he learns the truth. He comes out of the passage a changed person, but yet still the same person he always was. There is no director for this show, rather the playwright and ensemble worked together to create, choreograph, and shape the piece. One might question this method, fearing it might lead to lack of cohesion, but it works for them, and the result is a tight, well-paced, but not rushed 75-minute story. 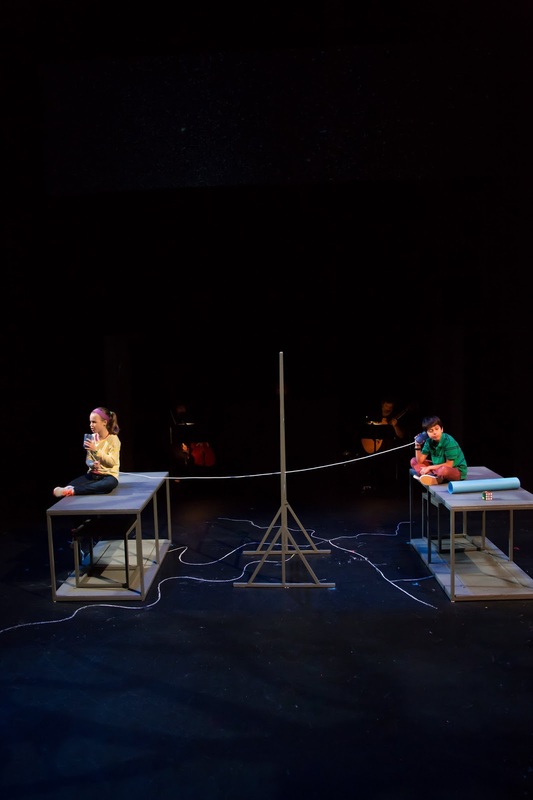 Elements of physical theater are used by the four-person Greek chorus (Cat Brindisi, Grant Sorenson, Kendall Anne Thompson, and Derek Prestly, who also adorably plays the family dog) as they tell the story and create the world of the play. The movement and choreography is unique and quite striking, especially a sort of time lapse fast-forward scene. The chorus may tell the story, but the main characters in it are children, and they've picked some good ones here: Alejandro Vega, a standout in many Children's Theatre ensembles of late, and Mary Bair, who commanded the big stage at the Guthrie like a pro last year in To Kill a Mockingbird. Both are open, present, thoughtful, charming, and completely winning in a way that only children can be. Completing this strong ensemble and bringing warmth and depth to their roles as Albert's parents are Lara Trujillo and Bob Beverage. Cassie and Albert on "cup comm"
David Darrow once again has written a beautiful score full of clever, funny, poignant lyrics and interesting, surprising, and affecting melodies, a score that sounds like the future of music-theater. There isn't the usual song-end-applause-dialogue-repeat cycle often seen in musical theater, but an organic and seamless flow from music to dialogue back to music. The score is beautifully brought to life with orchestration by Thomas Speltz and music direction by John Lynn leading the sparse but lovely three-piece orchestra (piano, cello, and guitar). I really need 7th House to start making and selling cast recordings of their shows, because this is music that deserves to live on beyond a single run of the show. The staging is relatively simple, in the Guthrie's black box studio set up as a traditional proscenium. 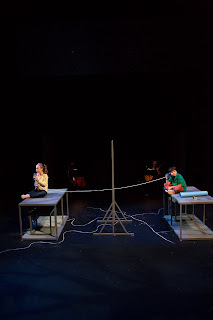 Just a few set pieces (a door, a window, a table) are moved around to create a sense of space, and video projections are used sparingly to further define location. Costumes are also simple, with a a white stripe on the grey-shirted chorus matching the white stripe of the set. The entire production design is detailed, yet subtle, to allow the story and music to be the star (set design by Eli Schlatter, costume design by Sarah Bahr, and projection design by Adam Raine). 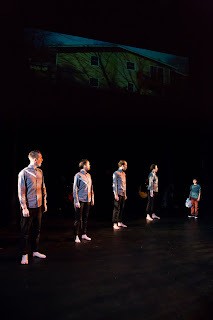 The Passage, Or What Comes of Searching in the Dark is a beautiful, funny, and poignant piece of music-theater about nothing more and nothing less than love, grief, friendship, family, self-discovery, and growing up. In short, it's about life - the joy and the pain, the epic and the mundane, told in an innovative and modern way. Continuing through December 4 in the Guthrie Theater's 9th floor Dowling Studio, get your $9 ticket to see an inventive new original musical before they're gone!